Just as I was starting to get tired and cranky from the seemingly endless climb to the pass, we caught sight of our first larch. All my tiredness was immediately forgotten as I practically skipped along the remaining trail to headlight basin, where we found a valley filled with golden larches and Mount Stewart for a backdrop! To make the day even better, we also saw several mountain goats! I was definitely wishing I had a wooly winter coat like they did. It was a cold day to start, and by the time we made it through Headlight Basin and up to the lake, there was a strong wind off the water making us even colder. We ate our lunch as fast as we could and headed back for the car without really exploring the lake at all. I would definitely like to return to this trail to spend more time at the lake on a warmer day. 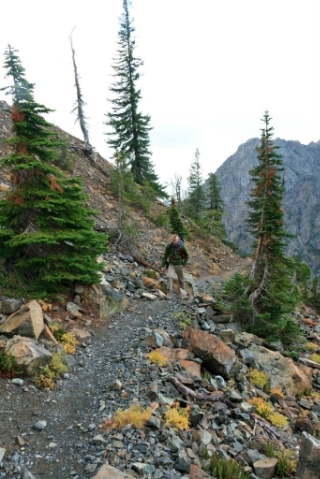 I will also certainly be wanting to go for another larch trek this fall- perhaps this trail.